Raven Queen Flips Tradition on its Crown! The world’s most spellbinding stories are getting turned on their crown at Ever After High, a high school for the teenage sons and daughters of famous fairytale legends. Raven Queen, daughter of the Evil Queen, doesn’t want to follow in her mother’s villainous path. After all, who wants to play the role of evil queen, especially if you don’t have an evil bone in your body? Now girls can help this stylish Rebel step into the spotlight — and find her own Happily Ever After. 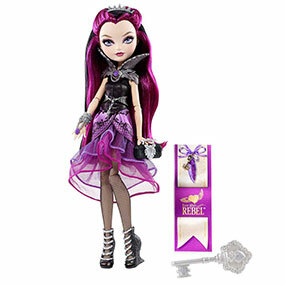 Ever After High Raven Queen Doll comes with a bookmark to tell her story. 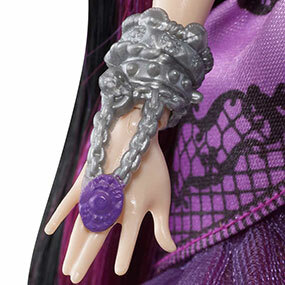 Girls can use the included doll hairbrush to style her long black hair colored with purple streaks. Hexquisite details rock her ensemble. 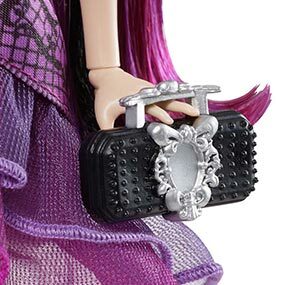 This highly-detailed doll accessorizes her outfit with a black studded purse. 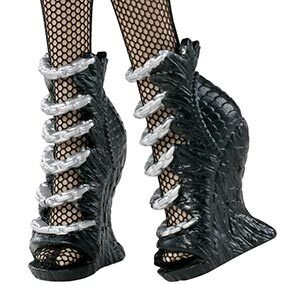 Her open-toe wedges complete the look. The daughter of the Evil Queen doesn’t want to follow in her mother’s villainous path. 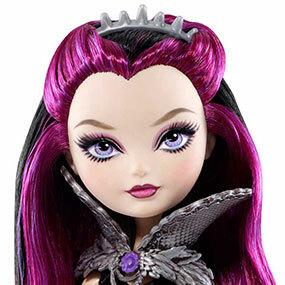 Raven Queen doll sets a new standard in fairytale fashion, with a look that would give any stylista mothergoosebumps. She rocks a tapered skirt made of sheer layers of purple and hexquisite details. Her black iridescent bodice rises dramatically into a tall, silvery, feather-detailed collar that perfectly complements her spiked headband. This highly detailed doll accessorizes her outfit with bangle bracelets and jewel ring, open-toe wedges, and a black studded purse. Girls can use the included doll hairbrush to style her long black hair with purple streaks. Plus, she comes with a doll stand for easy display and a bookmark that tells her story — and encourages girls to write their own! 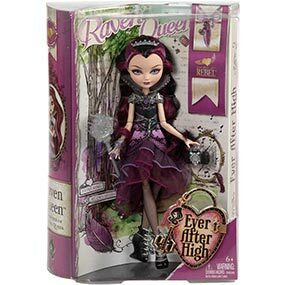 To start your own chapter, check out all the Rebel and Royal dolls in the Ever After High collection (each sold separately). Girls will flip their crown for this elite boarding school and the spellbinding students, who enjoy sipping hocus lattes in the village of Book End — and updating their MirrorBlogs on their MirrorPads. At Ever After High, these best friends forever after are ready to write their own stories and choose their own destinies, and girls will love joining them on the spelltacular journey. Hexcellent for play, spellbinding to display!